This is my absolute favorite topic and YES, giving is a huge part of a success plan. It is funny. Here in the US, when you are growing up, you are encouraged to be a go-getter to get ahead. But I am here to tell you that if it is all about getting, you need to just pack it up. Giving is "the bomb" (in a good way!). 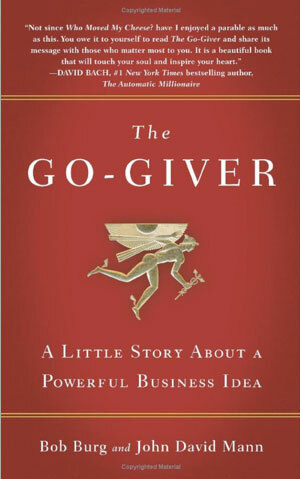 One of my favorite and most impactful books is the Go Giver. Bob Burg and John David Mann are the authors and I count them both as good friends as well. This is an allegorical novel (for those who aren't familiar, it is a genre that is focused on story telling but weaving in an important set of lessons). That also means it is an easy, quick read. Secret tip: One of my goals in life is to write an allegorical novel. I could tell you all about this book, but it would be so much better if you would just go buy it or download it to your Kindle. Click here for my interview with Bob, one of my very first radio interviews back in 2009, just after I read the book for the first time. Warning: You will want to buy a case of these books to give to people. It is that impactful! Giving back is core to success. Making it a priority is a business accelerator. Try it and let me know how it goes. Tomorrow our success soup letter is H. Hmmmmm.... I think I'll surprise you.